The great cities of the West weren’t even complete before urban dwellers fantasized escaping them. Compelled by sublime landscapes and the conservationist bug, 19th-century city slickers saw camping as a way to ditch the daily grind, plunging into the wilderness their forebears had just conquered. And after a century of high-tech camping innovations, from Gore-Tex hiking boots to smartphone apps, our desire to “rough it” is virtually unchanged. Recreational camping first became trendy in the late 1800s, popularized by the exploits of naturalist John Muir, who wrote extensively during his years living in Yosemite beginning in 1868. Remarkably, this was only twenty years or so after troubled wagon trains languished in barren deserts or frozen winter climes on their journey to the frontier (think Donner Party). Civilization was barely established in the western U.S. when “citizens were already seeking a respite from it,” observes U.C. Berkeley librarian and author Susan Snyder in her book Past Tents: The Way We Camped. The 19th-century antidote to poisonous urban blight? Going camping. From the get-go, journalists were all over the story. Popular essayist Charles Dudley Warner’s “In the Wilderness” series, published in 1878 in The Atlantic Monthly, presented camping as a blissful escape from the obligations of civilized society. “I suspect that many of us are, after all, really camping temporarily in civilized conditions; and that going into the wilderness is an escape, longed for, into our natural and preferred state,” wrote Warner. This camping impulse helped inspire the campaign to create America’s first National Parks. Top: Turn of the century campers enjoy simple pleasures out of doors. Above: Teddy Roosevelt and John Muir in Yosemite, 1903. California proved the perfect spot to develop a national dialogue on conservation, and one place this discussion unfolded was in the pages of Sunset. Founded in 1898 as a kind of in-flight magazine for the Southern Pacific Railroad to lure travelers westward via train and ultimately entice them to purchase real estate (Southern Pacific was the largest landowner in the West), the magazine promoted California as an exotic natural paradise, an “outdoor wonderland” as Fish describes it. Early Sunset contributors touted the region’s idyllic natural imagery at a time when “the big industrial cities of the East were perceived as being unhealthy or stressful.” Their antidote to this poisonous urban blight? Going camping. At the turn of the 19th and 20th centuries, many families camped in relative luxury, traveling on modern railways to arrive at a site with fully furnished tents already erected for them, not unlike the mobile home vacationers of today. But in a 1902 issue of Sunset, author Katherine Chandler provided a series of tips for more primitive camping in California, mixing practical advice with romantic interludes on life in the wilderness. Chandler was part of a growing crowd that preferred their holidays far removed from urban amenities such as roads and running water. These early campers usually hired a team of pack horses or burros, and knew the value of streamlined packing, especially in a day when women wore full-length skirts regardless of the occasion and were expected to carry whatever wouldn’t fit on their horses’ backs. A mule-train climbs a mountain path in Colorado around the turn of the 19th and 20th centuries. Chandler’s camping recommendations stuck to the basics: food, clothing, and shelter. For a full month’s tramp (who today even gets that much time off! ), she recommended women pack only two short skirts, a warm jacket of corduroy or denim, a cape or heavy shawl, bloomers and leggings (that match), a sun hat, a few dark-colored shirts, some good gloves, a nightgown, two pairs of underwear, comfortable shoes to wear around the campsite, and a sturdier pair “with a thick sole containing Hungarian nails, for tramping.” Chandler admits that though she’ll look charming at the start, after a month out of doors it will take “all the courage of her new-gained health” to face the return to civilization. Her food provision list was equally detailed (eg: 8 pounds of prunes, 12 cans of milk), with the total cost to feed five adults for one month coming to just under $35. Adjusted for inflation that’s around $200 per person; not a bad deal. Meals were made from simple cornmeal grits, pasta, or rice topped with canned tomatoes and grated cheese. Throw in a little bacon or freshly caught fish, and you had dinner. Other snacks included a cracker-type bread called “hard tack” and some dried beef (aka beef jerky); for the vegetarians, dried beans worked fine. A car camper does a little rustic grooming in Rocky Mountain National Park during the 1920s. Once automobiles became more available and affordable, they quickly replaced pack mules. 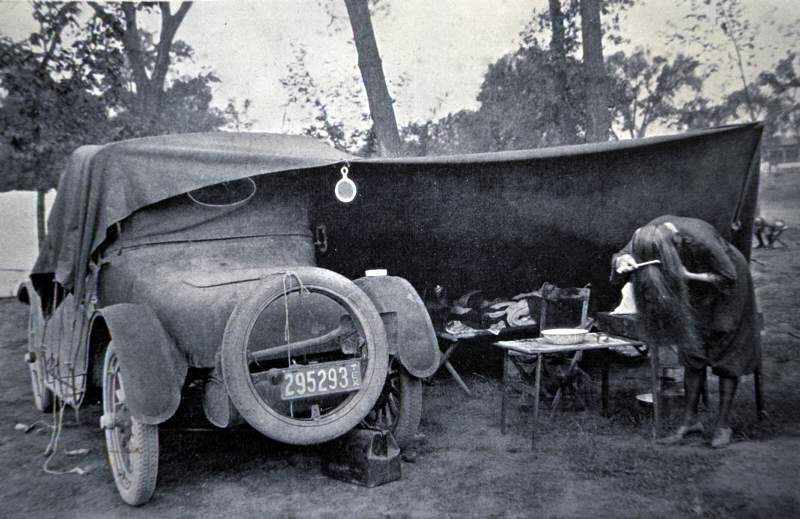 Car camping became the preferred method of escape, particularly because of the piles of tents, stoves, cots, lanterns, ice chests and other gear required for longer stays. 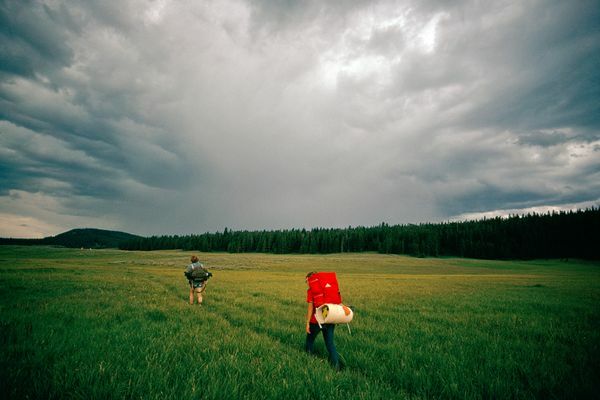 During the first half of the 20th century, even soft goods like sleeping bags and clothing were a chore to pack and tote, since they were made from heavy canvas, cotton, or wool. According to Bruce Johnson, an expert on the evolution of outdoor equipment who runs the History of Gear Project, the invention of nylon in 1935 forever changed the world of camping. Its usefulness was first demonstrated during World War II, when the U.S. military found new applications for the product in parachutes and weather-balloon cloth. By the end of the war, camping equipment innovators like Gerry Cunningham and Roy and Alice Holubar had taken notice, using nylon in their designs, which “changed gear from horse-packable to back-packable, and clothing itself entered a new era of warmth and lightness,” says Johnson. These brands helped return camping to its roots, focusing on experiencing the natural world with only the most basic tools you could carry. This do-it-yourself mentality eventually led Gerry Cunningham to publish an instructional booklet called Lightweight Camping Equipment and How to Make It, and soon full-fledged businesses were launched, like Frostline, which produced self-contained kits for making backpacks or parkas. This coincided with a larger social shift during the ’60s and ’70s, when people longed for a return to the simple pleasures of outdoor life, rather than dragging their household amenities out into the wilds. Cunningham was especially interested in the science of wilderness living, working for years with the Air Force to develop specialized equipment for outdoor uses. In 1972, he published another influential booklet entitled How To Camp and Leave No Trace, a culmination of camping’s growing popularity and increasing environmental awareness. The pamphlet countered trends of technological and consumptive excess, and explained the tenets of backpacking without disturbing your environment. Cunningham’s “Leave No Trace” ethic has now become an international campaign, helping establish public guidelines for appropriate behavior to sustain our natural parks. At left, a photo of campers raising a heavy wood-framed tent contrasts sharply with Gerry Cunningham’s book cover featuring lightweight backpacking gear. Courtesy Bruce Johnson. This image from 1972 of campers in Yellowstone National Park epitomizes the ideals of lightweight backpacking popularized during the 1960s. Source: National Geographic. Nicely researched and surprising to know that recreational camping has such a long history. It seems to me that not long ago (a year?) I saw on possibly the History channel, about early camping as in this article, but what was also talked about was campers cooking their food on engine parts as they traveled to their next camping spot and having a hot meal. Do you have any info about that? I want to prove to friends that I really saw that info and am not crazy! I started backpacking with “Backpacking One Step At A Time” as my bible. I still use the Svea 123 stove and, sometimes, the Sigg Tourist cookset I got back in the late 70s. Ditto for my down sleeping bag bought back then – I’ve kept it clean and in good shape. Re: Cathi’s comment: There was an aftermarket product for the Ford Model T called a manifold cooker (looks kind of like a mailbox) available. There are even cook books out on how many miles to drive to cook a roast and number of times to stop and baste. So yes people did back in the day cook supper while driving down the road. My husband and I cooked a roast and potatoes on the Rambler manifold between San Francisco Bay Area and Lovelock, NV in the mid-1960s. We wrapped the roast, potatoes and carrots in several layers of aluminum foil, then put in a loaf pan, put another loaf pan inverted on the first one. Wired each the 2 loaf pans together through the holes in the pan handles at each end. Wired the loaf pans onto the manifold and started our trip. We didn’t have to stop and baste. By Lovelock, Nevada we had a wonderful dinner for the whole family! By chance, could you tell me the source of the information about Katherine Chandler? She was my great-aunt, and I’m trying to find out more about her. Thanks! Started camping in the Smokies as a kid, with the family canvas tent, Coleman stove, lantern and cooler. Did some backpacking in High School, then some serious outdoors living in the Army. Sixty years on, and we’re still camping. Did a months worth last summer in the Rockies. Don’t backpack anymore due to a back injury, but still love day hikes and seeing the sights. And the trout fishing. “ ” When an initiate had to ‘ride the goat,’ everybody else would sit around the lodge room and have a big belly laugh.